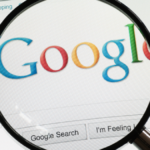 We’ve all heard the complaint before: Why doesn’t my Web page appear when I Google [fill in the blank]? To paraphrase George Berkeley: If a Web page is published but can’t be indexed, is it still published? Fortunately, this is a solvable problem—especially if your content contains a unique word or phrase. 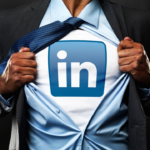 Consider this article from S&T Snapshots, a government e-zine I used to edit. 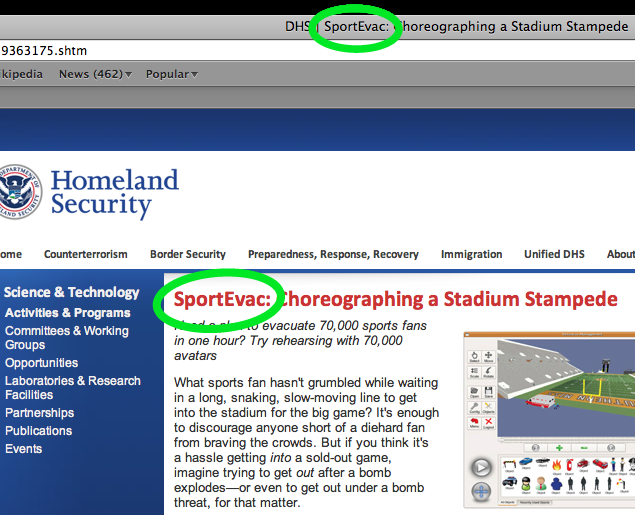 Its subject is something called “SportEvac.” As the above screen shot shows, simply by adding this word to (1) the Web page’s title (“DHS | SportEvac: Choreographing a Stadium Stampede”) and (2) its in-body header (“SportEvac: Choreographing a Stadium Stampede”), we ensured that Google would find it and rank it highly—in fact, first. Sure, the article itself is dotted with references to SportEvac, but this isn’t enough. Google prizes repetition, and in the right places. Similarly, Google [“MagViz”] and [“Cell-All”]. The reason the Snapshots on these subjects appear so highly—both second—isn’t a secret. It’s the result of search engine optimization. By adding the key word or phrase to the key places, you too can master the Google game.